My work explores North Norfolk, my childhood home and where I enjoy living today. I spend a lot of my time walking along the coastline with my sketchbook observing and drawing. It is a place where I feel a connection, a sense of presence. I then reflect on the studies once back at my studio surrounded by views of undulating countryside. The horizon is my focal point and my sketchbooks give insight into how I work as an artist; rapidly drawing my feelings of a place through mark making is key to recalling all the energy I sense when sketching the fleeting and ethereal light. Often on these coastal walks, my passion for the work grows, not only in an emotional response but also a spiritual one. Capturing the seasonal elements along the coast always delights me; the fiery hues of a blazing sunset, the misty sea frets together with the clarity of light on a bright breezy day. They all seem to come alive, conveying an intense visual experience which speaks to my heart expressing the colour and thanksgiving that I feel as an artist. International artist Tracey Ross studied textile design and then completed a Visual Studies degree at Norwich University of the Arts. As a member of the Norwich 20 Group she regularly participates in the annual Norfolk & Norwich Open Studios. Tracey was shortlisted for the National Open Art Competition, was a finalist for the Royal Society of Marine Artists (RSMA) and the Institute of Painters in Water Colours (RI) at the Mall Galleries. 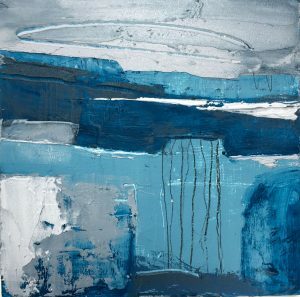 Her work is held in private collections and galleries both in the UK and in the Algarve, Portugal. Open Studios event this year – I shall be opening my work space for three weekends: 25/26/27 May 1/2/8/9 June. Opening 10am till 5pm. All welcome.